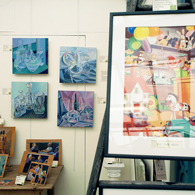 Our rather lovely art gallery at Burford Garden Company offers a curated collection of affordable, vibrant, original paintings and sculptures by artists and craftspeople from across the country, but mainly from the Cotswolds and neighbouring counties. Beautiful items for the home and garden have always been Burford's raison d'être and we have always sought out talented young designers and artists when selling products for our store. Our founder and Chairman, Nigel Johnson, has a Master's degree in Art, and with this longstanding passion it seemed fitting to extend the Burford offering to include unique works of art. 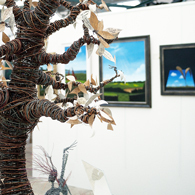 Under Nigel's personal curation, our gallery includes highlight works from artists such as the Oxfordshire-based Christopher Townsend, whose beautifully graceful tree sculptures, forged from iron, are very popular and highly collectable . On the painting side we work closely with renowned Cotswold landscape painter Rupert Aker, who exhibits an extensive collection with us. 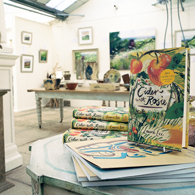 Rupert recently spearheaded our inaugural 'Celebrating the Cotswold Poets' exhibition, with a series of original works inspired by the poet Laurie Lee, who lived locally in the Slad Valley, the setting for his world-famous Cider with Rosie. Take a look at selected art online, or come along to browse in our relaxed gallery. We are situated at the far right side of the Burford Garden Company's main building. Come in the main entrance and turn immediately right, go into the Garden Furniture department and turn right into the Gallery. Everything on display may be purchased in store immediately. We continually change the collection to keep it fresh and exciting. We always welcome feedback and suggestions, so let us know what you think. Sign up for our email newsletter or keep an eye on our Events page for news of the exciting special exhibitions we run throughout the year, in addition to our ever-changing gallery exhibits.